Are you looking for a more efficient, cost-saving and dependable heating and cooling solution for your home? At Zimmerman Plumbing, Heating & Air Conditioning, we specialize in ductless heating and cooling services, maintenance and installation throughout Harrisburg, PA. We are a ductless systems expert in Central Pennsylvania and offer free installation estimates, special offers, parts and labor warranties, as well as a 24-hour emergency service. Did you know ductless heating and cooling has been around in the United States since the 1970s? It’s also a primary system used throughout many homes in Europe and Asia because of efficiency. Ductless systems provide heating and cooling as a heat pump using an indoor and outdoor unit. They don’t use traditional ducts to transfer your warm or cool air, but instead function utilizing a refrigerant line that connects the indoor air handler and the outdoor condenser. 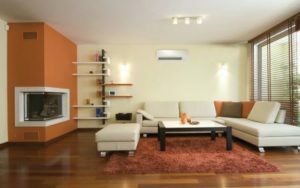 Ductless air handlers can be installed in the wall, floor or ceiling, and you can choose to have either one indoor to one outdoor unit or connect up to eight indoor units to one outside. 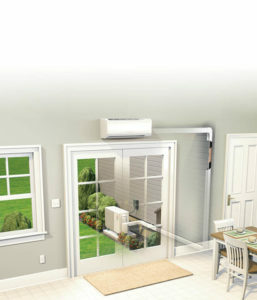 You can even utilize a ducted air handler attached to ductless mini-splits. Zone Control and Efficiency: With multiple indoor units, you can achieve zone control — or different indoor temperatures throughout your home. Each unit can be independently controlled using wall controls, remote control or smartphone applications. This in addition to high heating technology gives you flexibility, so you can see cost savings on your monthly utility bills. Cost Savings: It’s estimated that they use 60% less energy than home electric heating systems. Because mini-split heat pumps use better compressors and fans, they can adjust speeds and reduce energy consumption, saving you up to 30% over conventional air conditioning units. High Heating Capacity: When the temperature gets extremely low, some ductless systems will stay operational at full capacity, while heat pumps can de-rate at 40 degrees, which can eliminate electric usage spikes. Versatility: Ductless systems can be installed in your home as a wall unit, floor mounted, ceiling cassettes and as ducted air handlers. Wall units come in a variety of sizes that best fit the usage of the room you’re installing it in and are offered in several colors that blend seamlessly with your furnishings. Reliability: With proper installation and maintenance, ductless heating and cooling systems are expected to last longer than a traditional heater and air conditioner. 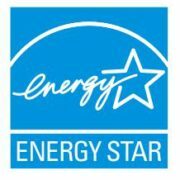 Zimmerman can offer you up to a 12-year warranty on all ductless system components and up to a 12-year labor warranty. Quiet Operation: While in use, indoor ductless systems are as quiet as a whisper, so they don’t disturb your daily living. Outside, the condenser is hardly noticeable. Read more to learn about the cost of a ductless system.